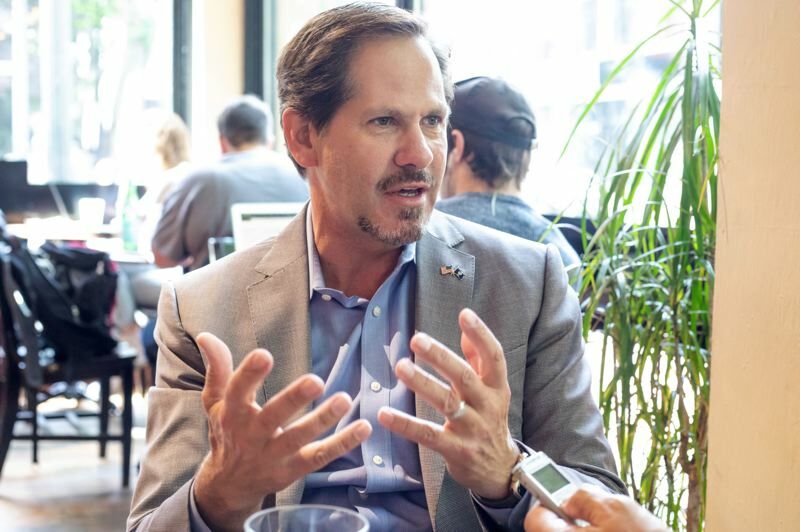 If there is anyone well-equipped to make a pitch for the governor's seat in Oregon, it's Knute Buehler. That's a play on words, but Buehler would like to think it's a statement of truth as well. Buehler, who won the Republican primary and will face incumbent Kate Brown in the November general election, is a former Oregon State pitcher who considers his background in sports an important piece of who he has become as a person, a professional and a political figure in the state. "I like to win," Buehler says during a recent interview at a downtown Portland coffee shop. "I've lost one political campaign, and I never intend to do it again. "The competitiveness you must show in sports transfers to personal perseverence. We all have ups and downs in our lives. Success comes to those who persevere. "That's the secret to my successes — never give up, and keep chipping away. I don't take no for an answer. If I reach a roadblock, I take a step back, look at the situation and try another route." Buehler, a Roseburg native who has lived in Bend since 1997, recently moved to Tualatin as a hedge toward his gubernatorial campaign. Buehler and his wife, Patty, lived there for four years in the 1990s, when he worked at Oregon Health & Science University. Buehler, an orthopedic surgeon, won election to the Oregon House of Representatives in 2014. Son Owen, 24, works in San Francisco while daughter Hannah, almost 21, is a student at Pitzer College in Claremont, California. "It's almost back to the future for me," says Buehler, who turns 54 on Aug. 1. "The first house we bought was in Tualatin. After 25 years, I told my wife, 'We've come full circle. Now we're living in an apartment.'" Sports have been at the center of Buehler's life since his days at Roseburg High. As a senior, he was a star pitcher on the baseball team and punter and backup quarterback on a football team that went 14-0 and beat Lebanon 22-0 for the state championship. Coach Thurman Bell's crew steamrolled opponents by an aggregate 442-70 that season. "I got to play some quarterback (behind starter Kory Wilson) and punted through that season," Buehler says. "We were a powerhouse." Buehler learned about discipline, dedication and teamwork from the legendary Bell, who coached at Roseburg for 45 years and won 331 games. His teams made the state championship game nine times and won four titles. "Thurman created a really great culture around the team," Buehler says. "It's all for one, and not about the individual player. Everything he did was structured around molding the team. He prepared you to not only be a success in high school football but in life." 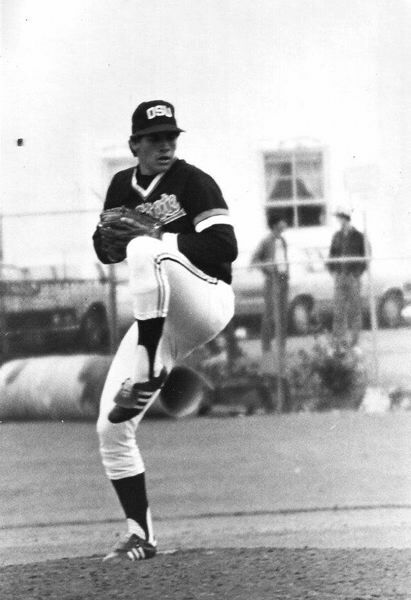 Buehler decided to walk on in baseball at Oregon State as a freshman in 1982-83, with both athletics and academics in mind. Relying on a slider that kept hitters off-balance, he was a member of Beaver teams that made the NCAA regionals in 1983 and '85. He allowed nine earned runs in 12 innings and 11 appearances through the three seasons. Those OSU clubs were led by such outstanding pitchers as Dave Brundage, John Sipple, Scott Anderson and Jeff Reece. "Those were really talented staffs," Buehler says. "My job was middle relief. When the slider was on, I was able to produce ground balls. If they left me in too long, (opponents) would figure out I had only one pitch. It was tough after a few hitters. I watched a lot of Pac-10 baseball. The innings pitched were pretty limited, but it was a great experience." Then-OSU coach Jack Riley is honest with his assessment of Buehler's talents as a Pac-10 pitcher. "Knute never had what you would call a great feel for the game, or for pitching," says Riley, who coached at OSU from 1973-94 and is now retired and living in Corvallis. "He struggled a bit with the strike zone, but he had a pretty good arm." At the end of each season, Riley would do exit interviews with his players. "Knute was the only player I ever had who asked, 'Is it all right for players to critique coaches, too?'" Riley says with a chuckle. "I said, 'It certainly is. What do you have on your mind?' He said, 'Well, I think you put too much pressure on pitchers to throw strikes.' I said, 'Knute, you just said the wrong thing. That's the name of the game.'" Buehler had more going, though, than just baseball. He gave up his senior season of the sport to concentrate on completing his degree in microbiology and U.S. history. "I couldn't play baseball and graduate on schedule," he says. "I pushed off all the science classes that are usually in the afternoon until my senior year. I knew I'd reached my (top) level. The Pac-10 was as far as my baseball career was going to take me." Buehler graduated with a 4.0 grade-point average and, after two years at Johns Hopkins Medical School, became the first OSU graduate to earn a Rhodes Scholarship. "Knute was such a good student, his academics were No. 1," Riley says. "He loved baseball, but it was secondary to his education. I had great respect for that, and for him as a person. He was a really good teammate. I enjoyed coaching him very much." Buehler says Riley was a good influence. "Jack is one of the premier competitors I've met, both personally and with the culture he instills in his players," Buehler says. "Oregon State's current success in baseball is based on the foundation he built during his years there. He kept that program alive and thriving during an era when a lot of universities were cutting baseball." Bell and Riley remain important role models in Buehler's life. "I know my personality and my competitiveness is shaped by being around those two gentlemen in my formative years," he says. Buehler has stayed close to his alma mater's sports teams. He has season tickets for OSU football, attending about half of the home games each season and traveling for a road game "about every other year." He goes to three or four home baseball games a season and has struck up a friendship with coach Pat Casey. "I have great respect for Pat," says Buehler, who threw out a first pitch during the Arizona State series at Goss Stadium in late April. "He's done a wonderful job. Oregon State is so fortunate to have him — not only for what he has done for baseball, but the number of lives he has impacted in such a fundamental way with the players there. That's part of his success. Not only is he a great baseball mind; he is also a great molder of young men. Almost anyone who has been coached by him would share that sentiment." Buehler, a Cincinnati fan during the years of the Big Red Machine in the 1970s, follows college baseball closely and relaxes in front of the television watching the MLB Network when time allows. "That's my release these days during the campaign," he says. Another campaign — the one to build a baseball stadium — interests him a good deal. "I'd love to see major league baseball in Portland," he says. "It would add a lot to the community. The devil is in the details. But it would be a big positive, to not only Portland but to Oregon, to have major-league sports at the premier time in Oregon weather-wise. "Every night would be a festival-like atmosphere not only in the stadium but in the surrounding area. Who wouldn't want to be in Oregon on a summer night watching big-league baseball? It would be a huge advantage in many ways, and it would allow us to promote the state to a much bigger audience." The 6-foot Buehler is still close to the 180 pounds he carried during his college years. To stay in shape, he runs and lift weights, does downhill skiing in the winter and mountain bikes in the summer. Buehler says he learned many lessons from his participation in sports. "At Roseburg, I was a star pitcher, but at Oregon State, I was a bit player," he says. "I learned you need to find your role on any team. Many times, it's not as the star. The important thing is to do absolutely the best you can in your role, to try to excel at whatever part you're playing. If everyone is doing that, you have a very high-performing team." Buehler is finding that to be true in his bid for the governorship, too. "As we create our campaign team, it's about finding people who can succeed in their roles," he says. "Sometimes you have to move people around a little bit and find the role that they're going to personally succeed at at the level we need for the team to perform at its best." Buehler wasn't born with a silver spoon. His father, Werner, grew up in rural Drain; his mother, Dollie, mostly in Oklahoma. Werner worked as a butcher in a grocery store in Roseburg. Neither of Knute's parents graduated from high school. "I've always been kind of an underdog," he says. "For me to even graduate from college was a big accomplishment for our family. I was an underdog to become the first Rhodes Scholar from Oregon State. I was an underdog to walk on and stick at Oregon State, with such a great pitching staff. And I'm going to be the underdog who goes on to win the governor's race." During his time at Johns Hopkins — before and after his two years at Oxford — Buehler's eyes were opened to a different side of life. "I lived in east Baltimore, a disadvantaged portion of town, a tough area," he says. "I encountered things that a kid growing up in Roseburg and going to Oregon State had never seen before. My first year, I helped deliver several babies that were addicted to crack cocaine. My next year, I saw a gunfight in the Hopkins emergency room. My third year, I saw dozens of young men come to the hospital and die of quite rare infections. It turned out they were HIV-positive. "I was living around poverty like I had never seen before. I realized I needed a broad education to understand the forces that had created those kind of deep societal problems." Buehler got it at Oxford and in medical school. He continued it through his career in medicine. He hasn't fully retired as an orthopedic specialist — he is an emeritus partner in his medical group — but quit doing surgeries about a year ago to devote himself full-time to a bid to become governor. That idea spawned four or five years ago. "A well-lived life has three stages," he says. "In the first stage, you learn and prepare yourself. In the second, you earn a good living and take care of your family and your obligations. If you do those two things well, then you should serve and give back in some public capacity. "When I looked around, I felt our government and political system needed help in not putting the state and country at risk. A few years ago, my wife told me, 'You have to quit complaining about how things are going in Oregon, or you have to stand up and do something about it.' She probably wishes she'd have never said that." Or, more likely, Kate Brown wishes as much.